Rare coins are an interesting choice to help diversify your portfolio. These should not be confused with gold or silver bullion holdings as they are not the same. 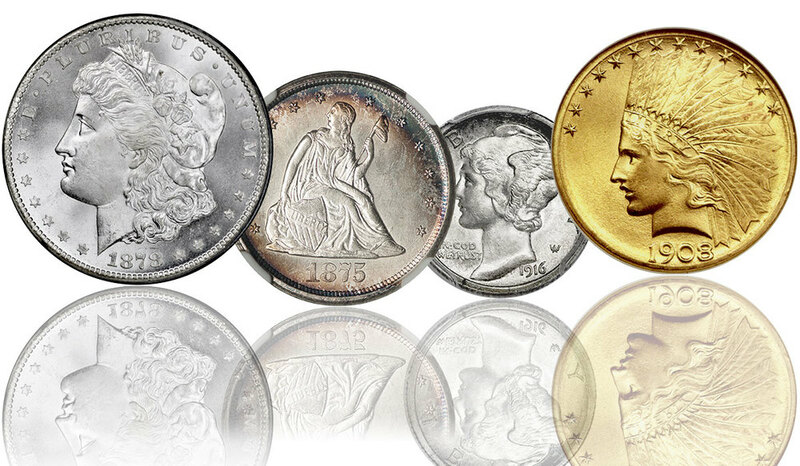 For six good reasons, rare coins provide you with better protection than most any asset class on the market today. What Makes Some Coins Rare? When you are dealing with bullion coins, you are talking about pieces that have typically millions of them struck every year. Many older coins made in the U.S. from the 1790’s to the 1930’s exist in quantities of tens of thousands or even much fewer. There are two reasons this is the case. The first of these is that on three separate occasions, the U.S. Treasury issued recalls on gold coins. They began this practice during the 1830s. Gold contents had been haphazardly put into earlier issued coins and did not match up with the face value of the coins. Again in the 1860s, Treasury needed gold to help pay for international trade during the Civil War. Many of these coins were melted down to help cover the trade imbalances the country ran during these years. A last and most dramatic instance of coin recall happened in 1933. This was when then President Franklin D. Roosevelt ordered that all gold coins privately held be turned in to the U.S. Treasury Department. Congress worked with him to enact a law that outlawed private citizens owning gold at this time. Another reason that older coins are rare has to do with how many years they circulated. A number of them simply got lost. Others were traded and used enough that they became too worn for any collector to have a real interest in collecting them. These worn down coins are as good as lost or destroyed from a collectible standpoint. Rare coins offer you more than just historical and beautiful pieces to own and admire. They add value to your portfolio just as works of art do. Consider the following six advantages to having rare coins. • The long term performance of rare coins has been excellent – rare coins in general and rare gold coins have both done extremely well over longer periods of time. Because of their additional demand from coin collectors, rare coins have generally outperformed gold bullion. According to the Neil Berman report showing asset returns from 1979 to 2008, rare coin returns in all conditions have averaged 10.03% per year. Better conditioned coins graded MS 63, 64, or 65 returned 11.45% on average each year. In top certified conditions of MS65, this rare coin return rose to 13.5% annually during the 30 year period measured. Compare this to the average annual return of gold bullion in the same thirty year time frame of only 5.37%. It becomes clear that rare coins have performed at least twice as well as gold bullion has in a 30 year period. • Private gold bullion ownership has been restricted – The government demonstrated in 1933 that it can confiscate privately held gold by simply passing a law. This law only applied to bullion gold in the past. It specifically allowed rare gold coins to continue to be held. Based on past precedent, this makes rare gold coins the safest way to own and hold gold. • Rare coins protect your financial privacy – When you buy and sell bullion coins, the dealers are required to keep records of the transactions. Buying rare coins does not create any government paper trail. After you purchase and acquire them, it becomes your own private business what you do with them. • Rare gold coins offer diversification hard to find elsewhere – When you buy rare gold coins, you gain the advantage of diversification into gold and also into a rare and valuable collectible. These coins have a track record of moving independently from other investments. When you already have large holdings of real estate, stocks, bonds, and cash instruments, rare gold coins will provide you with an investment that can offset losses when the others are falling or trading sideways. In 2008 when stocks were down an average of 37.3%, rare coins rose over 20% while gold bullion went up just 4.3%. Bullion coin prices may signal a warning for the economy, but rare coins generally outperform them. • Rare gold coins offer the same safety and security as gold bullion – rare coins that are comprised of gold also provide the historical safety and protection that gold always has throughout the ages. Gold has stood the test of time as governments rose and fell, inflation raged, and currencies were debased. Over three thousand years ago stocks, bonds, and paper money did not exist, but gold was already prized and stockpiled. It is just as universally accepted today as it was in the ancient world. • Rare coins have artistic appeal – putting asset value and diversification aside, rare coins are beautiful works of art. Many of these are great masterpieces in their own rights. America’s leading craftsmen and artists created these rare coins and it shows. Looking at stock certificates or real estate deeds will never give you the same aesthetic satisfaction as holding a beautiful piece of history in your hands.